The Model B Tester is designed to cover the hardness of aluminum alloys from the 1100 to the 7075 series. The 20 graduations on the Webster dial indicator covers the range between 25 and 110 on the Rockwell E Scale. The graphs on this page show the range covered by the Model B Tester. 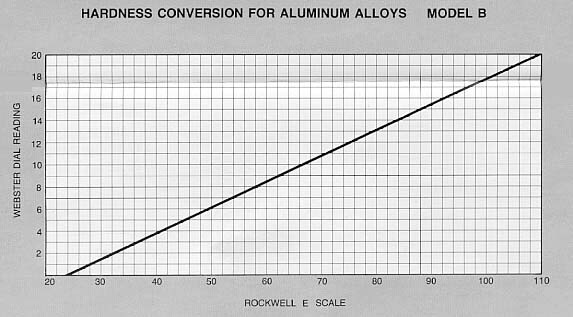 The lines for these graphs were derived from many tests on a variety of alloys and show an average curve. Production lots of alloys can vary in work-hardening characteristics which may result in instances where readings do not fall precisely on the curve. All tests were conducted with the Model B Tester set to read 16 on a standard test strip of 6061-T6 aluminum alloy of Rockwell E 90± 1 hardness.